Regardless of if you are a casual runner or training for a marathon, it's important to condition your entire body and do exercises that balances your body. Runners can benefit from Yoga Fitness Classes in Salem, MA. This is an effective way to tone and lengthen muscles which can improve any runner's performance. An increasing number of women are engaging in boxing training cardio workouts because of the quick weight loss results; but boxing also improves speed and reflexes. Additionally, this workout will also shape up your figure with the muscle-sculpting moves you learn in the training. As you lose weight you want to also tone your body so your skin does not sag. Boxing moves can help tone muscles and can help restore the elasticity of your skin. Sagging skin is a common aesthetic issue that many people encounter, especially women. This condition can make people uncomfortable and create insecurities and lower self-esteem. Group exercise boxing drills in Salem, MA can be a perfect workout to address this issue by building muscles to firm up skin. This can help empower women, fend off insecurities and negative thoughts and yield a leaner figure to be proud of. Boxing workout class promises a more fit body to help people stay active and look great. In addition, this can help release the tension in the body and relieve stress with punches, jabs, kicks, and uppercuts. To find out more about the benefits of boxing workout classes, contact Salem Fitness Center. In today's society it is very important that women feel empowered and understand the basics of how to protect themselves. The simple skills that can be taught in a women’s self-defense class allows women of all ages to gain both the physical and psychological benefits of being able to protect themselves. At the same time, that they are learning these practical skill in a safe environment, they will be improving their fitness and mental health. The physical conditioning develops strength and reflexes, as well as mental awareness of surroundings. Females will learn to be empowered and prepared in dangerous situations. Women’s self-defense classes in Salem, MA help develop self-discipline. By going to these classes on a regular basis, they’ll learn new and easy-to-execute skills. Since self-defense requires concentration, awareness, and coordination. Attending these classes will teach women and teens how to focus on a target while controlling your body’s movements. As a result, women and girls are more prepared and confident to protect themselves or remove themselves from an uncomfortable situation. Nothing feels better than knowing you can protect and take care of yourself physically and mentally. Women’s fitness is not only about losing weight and getting in shape, it is also about empowering them and making them feel safe, secure, strong, and confident. The increased feelings of safety and improved overall fitness from in self-defense classes are incomparable. To find out more about women’s self-defense classes contact Salem Fitness Center. Fitness boot camp never goes out of style because this military-inspired physical fitness program can burn a serious amount of calories faster and more efficiently. This fitness program incorporates workout routines from the traditional, proven elements of military training which focuses on strengthening the core, increasing cardiovascular capacity, and improving balance and coordination. The fast and dynamic nature of boot camp can give you a clear and fast start and target the muscles groups you want to address. 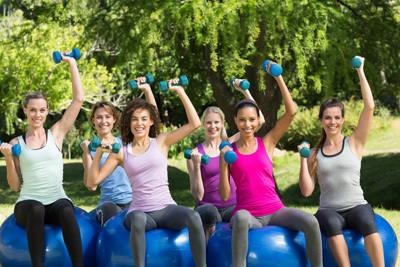 Boot camp classes in Salem, MA offer a variety of exercises to keep the workout exciting. Getting fit outdoors is a fun way to exercise, get energized, while becoming more confident. Joining boot camp classes will keep you fired up to succeed in your fitness goals. Also, when you exercise and train with a group of people there is built-in motivation and healthy competition. A boot camp class is coupled with group spirit and camaraderie, so you’ll have the perfect recipe for fun and success. There are few exercise classes or activities more fulfilling than successfully completing a boot camp workout. Boot camp classes allow you to get a more fit, leaner body faster than other types of workouts. Join a boot camp and see results. To find out more about fitness boot camp classes, contact Salem Fitness Center. Due to the different physical forms, genetics and lifestyle, there are ailments that women are more prone to than men. Osteoporosis and various cancers are just two examples. However, exercise for women coupled with healthy eating and lifestyle habits can keep cancer and other diseases at bay. Women's exercise programs in Salem, MA can help strengthen the body's resistance against disease. Studies show that women who engage in various fitness routines have less chance of developing cancer. Stress also makes women prone to different illnesses which can be relieved through exercise. Additionally, toxins in the body can be released through sweat. Salem Fitness Center offers a women's only fitness area which motivates many women to participate in various fitness programs that are exclusively designed for them and these women's fitness programs have many benefits. Contact us today to find out more information. Boxing was considered a combat sport in the past. Now it is integrated in many forms of workout routines due to the many benefits it has in losing weight and gaining strength. Many fitness enthusiasts fuse boxing training cardio workouts with other exercises because participants will see quick results when done regularly. Although boxing is often performed through sparring sessions, many participants now enjoy the group exercise boxing drills in Salem, MA. They find punching the bag in a group class with co-participants a fun and stress-relieving workout. Meanwhile, its effectiveness in burning fat and toning muscles are indisputable. With the help of trained coaches, you will achieve a knockout body with toned muscles and improved strength in no time. Boxing workout class has earned exceptional rave reviews from enthusiasts who never thought they could achieve marvelous results in just a few sessions. Whether its for losing weight, shaping up your body, or enhancing your strength and endurance, boxing group exercise is a quick and engaging way to reach your fitness goals. If you are interested in this group workout class, contact Salem Fitness Center. Everyone benefits from exercise and physical activity. Whether you’re young or old, fit or out-of-shape, healthy or recovering from injury, physical activity can ease symptoms of many chronic conditions and prevent illness. Exercise has the potential to greatly improve everyone's quality of life. Contrary to popular belief, weakness and poor balance are actually linked to inactivity rather than age. Thus, there is no reason that older adults and seniors shouldn't remain active and increase their activity levels even as they age. To help seniors engage in an active lifestyle, an age-appropriate exercise program like “Sweating to the Oldies” is especially designed to address their needs. Seniors have different needs and physical limitations than younger exercisers but they have the most to gain from the benefits gleaned from exercise. Sweating to the Oldies in Salem, MA is a group exercise class strategically developed to suit the specific needs and limitations of older adults and seniors. This fitness program is low intensity and low impact to protect joints, bones, soft tissue, and muscles. For this reason, the risks of pain, fatigue, and injury during and after the sessions are dramatically minimized. Exercise is an important part of a healthy lifestyle. Though many see the results of exercise as skin deep, the health benefits are far more important than improving physical appearance. 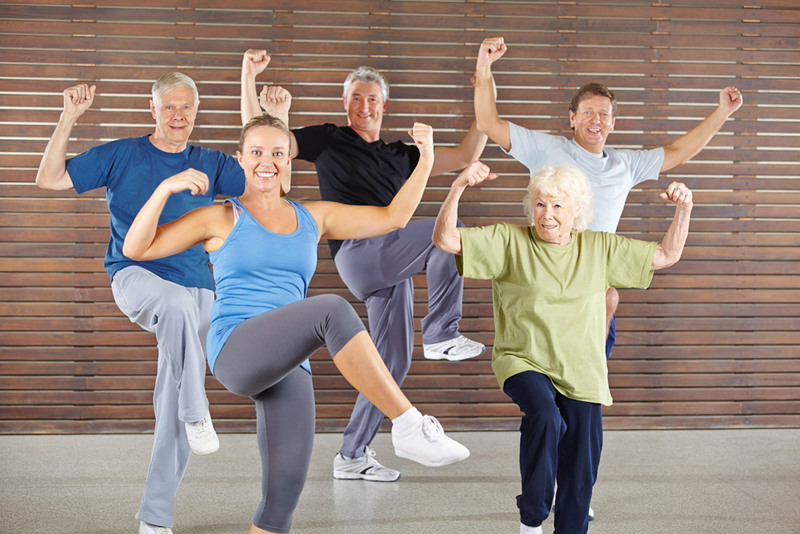 Having a physical fitness program for elderly people and incorporating exercises into their lifestyle not only makes them look better, but it will help them feel sharper, more energetic, and able to experience a greater sense of well-being. To find out more about the benefits of Sweating to the Oldies, contact Salem Fitness Center. Gentle yoga is perfect for beginners, older practitioners, people who are recovering from an injury, or those who have limited flexibility. Gentle yoga is exactly what the name implies, a slower-paced and less strenuous form of yoga. Practicing gentle yoga exercises regularly offers many health and well-being benefits such as increased strength, flexibility and balance, reduced stress, better sleep, and mindfulness. These are just part of a long and growing list of the benefits you will experience if you add gentle yoga to your workout routine. Yoga classes in Salem, MA offers a relaxed learning curve and certified yoga instructors simplify and explain the poses as you go with modifications, repetition, and step-by-step adjustments if necessary. Stretching and balance poses are simplified and repeated to train and challenge the muscles gently and gradually. With gentle yoga, there’s no need to hurry to finish a sequence and no agitation in holding a pose. This allows you to move your body comfortably and encourages movement without the potential for strain. Gentle yoga also focuses on alignment and breathing techniques by slowing your breath and movement to emphasize relaxation and reduce stress. The slower pace and the lower intensity will help you calm and center yourself throughout the class. With quiet, simplified, and focused movements, practicing yoga provides a gateway to meditation and mindfulness. It’s all about relaxing and letting your body get what it needs. To find out more about the health benefits of gentle yoga exercises, contact Salem Fitness Center. Boot camp classes provide a dynamic, total body workout that promotes cardiovascular health and muscle growth. These classes are a great way to speed up results because they incorporate drills that are designed to improve strength, power, agility, balance, and coordination. Aside from being an effective method of shedding excess body fat, they provide a number of benefits unique to the class format. Boot camp classes in Salem, MA string together circuits of intense exercises which involve a rapid-fire sequence of moves, pausing for only a few seconds between exercises. It’s fast paced and intense structure help build strength and endurance. By performing drill after drill including push-ups, sit-ups, pull-ups, squats, planks, and jumping jacks, you’ll be able to get your body in top shape fast. It targets every major muscle group in the body. And, because you breathe and sweat hard, it’s a great way to boost your cardio fitness for a quick start to weight loss and fitness. Having a physical fitness program that keeps you motivated and engaged is beneficial to your fitness goals. Working out with a group that shares the same fitness goals while developing social relationships is a fun and exciting way to get in shape and become confident about your own abilities. To find out more about boot camp classes, contact Salem Fitness Center. There’s a big reason why boxing is the workout of choice by many men and women, and even popular celebrities and models. Not only does boxing offer a strength and cardio workout in one, but it is also the best way to get in tune with your inner toughness. By adding boxing training cardio workouts into your exercise regimen, the amazing perks of punching, kicking and jabbing will have you relieving stress while keeping you fit. In addition to boosting your strength and cardio, group exercise boxing drills in Salem, MA can help improve a number of skill-related parameters of fitness such as balance, coordination, reactivity, and agility. Once you’ve learned how to execute the proper form of every move, you’ll be able to sculpt different muscle groups like the arms, legs, back, shoulders, and core. Because this full-body workout is also a high intensity workout, you’ll be able to burn major calories fast. With a potential burn rate of 13 calories per minute, boxing is as effective as other intense types of cardio like running and cycling. Furthermore, one thing that sets boxing apart from other workouts is the stress-relief it provides. Boxing is a healthy and an effective way to help you let go of the tension, but also the rush of endorphins will make you happier too. Joining a boxing workout class can help you build confidence and discipline. With boxing, there’s always something new to learn or someone new to spar with, so there’s a motivation for you to keep training and never stop learning. To find out more about boxing training cardio workouts, contact Salem Fitness Center.